IMPORTANT: Calibrations are governed by the CODE number stamped on air horn directly above the fuel inlet. IMPORTANT: Calibrations are governed by the CODE number on the attached code tag. IMPORTANT: Calibrations are governed by the CODE number stamped on air horn. The 1957 Buick gasoline tank is attached by two strap type supports to the body under the trunk compartment, where it is seated against strips of anti-squeak material. Two internal baffles spot-welded to the upper half at centerline of tank at the support seats act as struts to maintain the shape of tank and prevent flexing due to weight of gasoline and pull of the supporting straps. The 1957 Buick gas tank filler is soldered into an opening at the rear upper center of the tank, and is accessible by lifting a door in the center of the rear bumper. 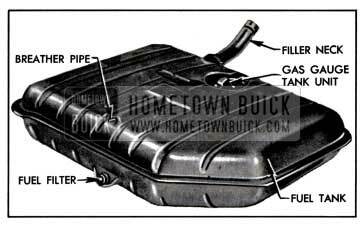 The 1957 Buick tank is vented at a special pipe rather than at the filler cap. This breather pipe is located at the forward top center of the tank and has a rubber hose extending from it up into the area just under the rear spring cross member. See figure 3-1. 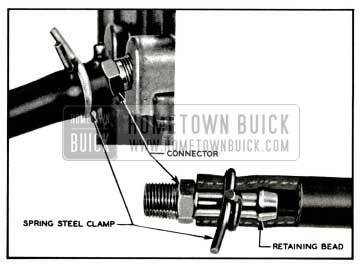 The 1957 Buick tank outlet is located at the forward bottom center of the tank and consists of a combination feed pipe, drain plug, and strainer. See figure 3-2. This strainer or filter consists of a monel mesh screen and may be easily replaced after removing the gas hose from the feed pipe and draining the gas tank. CAUTION: When installing the strainer assembly in the tank, torque to 7-10ft. lbs. Overtightening may break the flange loose in the tank and cause a leak. 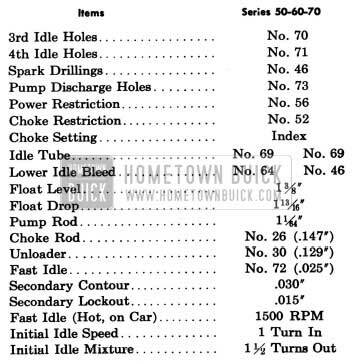 All 1957 Buick fuel lines are made of synthetic rubber hose. This hose is supported along the outside of the right frame rail by clips. All connections are made to non-corrosive fittings using wire hose clamps. See figure 3-3. The 1957 Buick fuel pump is mounted on the lower right side of the timing chain cover. It is actuated by a hardened, chrome-plated, stamped steel eccentric mounted on the front side of the camshaft sprocket. The pump is inverted, thereby placing it in a lower, cooler location. It has a built in air dome with a diaphragm to damper out pulsations in the fuel stream. The construction and operation of the pump are described in Section 3-D. Engines of all series are equipped in production with either a Carter, Stromberg, or Rochester downdraft type carburetor. Each make is considered standard and it is not intended that these units be interchanged to provide “optional” equipment. 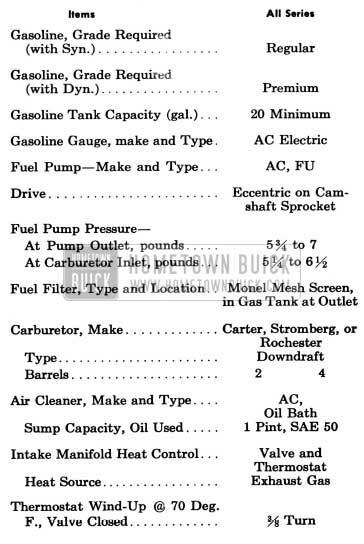 Series 40 engines use a 2-barrel carburetor and Series 50-60-70 engines use a 4-barrel carburetor. All carburetor assemblies include automatic choke mechanism and a carburetor starter switch. 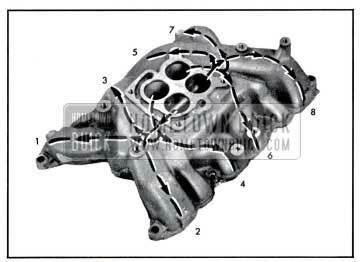 The Carter carburetors are described in Section 3-E (2-barrel) and Section 3-F (4-barrel). The Stromberg carburetor is described in Section 3-G. The Rochester carburetor is described in Section 3-H. 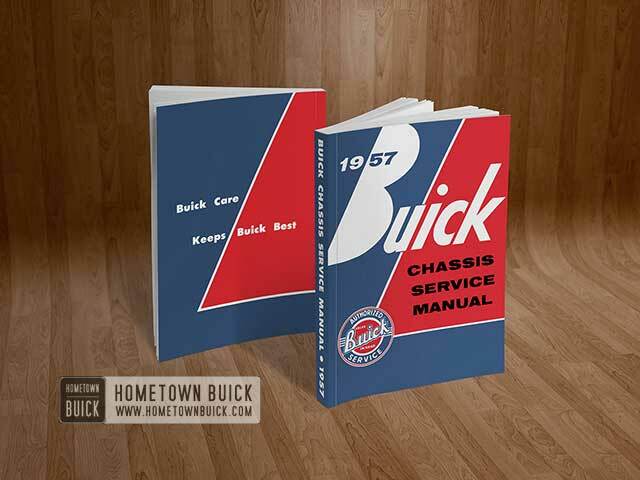 The carburetor starter switches are described in Section 10-E.
All series engines are equipped with heavy duty oil bath air cleaners combined with 1957 Buick intake silencers. The 1957 Buick air cleaner removes abrasive dust and dirt from the air before it enters the engine through the carburetor. 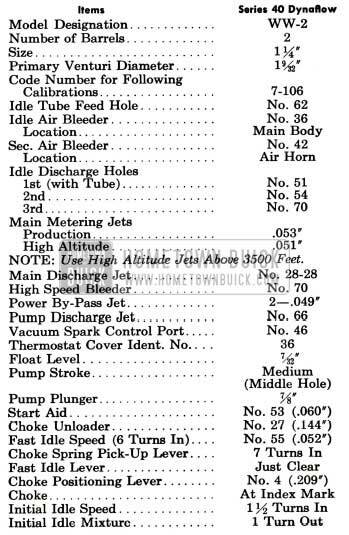 The 1957 Buick intake silencer reduces to a very low level the roaring noise made by the air as it is drawn through the intake system. The cleaner and silencer also functions as a flame arrester in event of “backfire” through the intake system. There are two air cleaner and silencer assemblies; one for the two-barrel carburetors and one for the four-barrel carburetors. From the top both look the same, but the carburetor connection tube is a different size. Both air cleaners are fastened to a bracket at the front in the same manner. 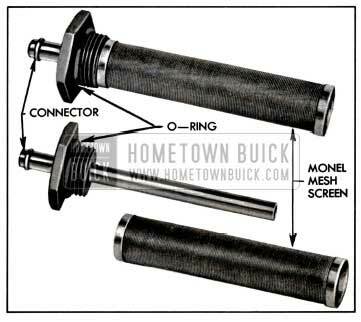 The 1957 Buick air cleaner consists of an oil reservoir and a cleaner element containing a filtering mesh which nests down into the reservoir above the oil level. The reservoir is filled with S.A.E. 50 engine oil to the “OIL LEVEL” line which requires 1 pint of oil. Incoming air passes downward through the passage between the oil reservoir and cleaner element, impinges on the surface of the oil and turns upward into the cleaner element. The air carries oil into the element to coat the finely divided filtering mesh. The air thus exposed to a large oil wetted surface to which the dirt and impurities adhere. The cleaned air then passes through the silencer and into the carburetor. See figure 3-4. When the throttle is closed, any excess oil on the filtering mesh drips back into the reservoir carrying the collected dirt with it. This dirt then settles to the bottom of the reservoir. 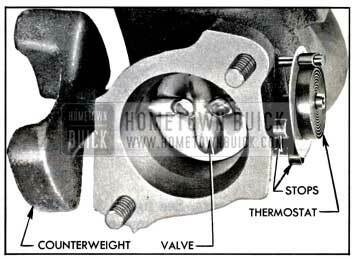 The 1957 Buick carburetor throttle control linkage is designed to provide positive control of the throttle valves through their entire range without being affected by movement of the engine on its rubber mountings. The linkage also serves to operate the carburetor starter switch when cranking the engine. The accelerator pedal rod is connected to a lever on the lower end of an equalizer shaft which is mounted between the body cowl and the rear end of engine. Movement of the pedal rotates the equalizer shaft, which actuates the carburetor throttle shaft through an upper lever and connecting rod. The throttle return spring is connected to the equalizer shaft upper lever and to an anchor bracket on engine. See figure 3-11. On cars equipped with Dynaflow Drive, a dash pot is mounted in position to be contacted by an arm of the carburetor throttle lever as the throttle is closed. The dash pot cushions the closing of throttle valves to prevent sudden shut off which might cause the engine to stall when the accelerator pedal is suddenly released. The throttle linkage also actuates a separate lever and rod connected to the stator control valve in the Dynaflow high accumulator. A low-restriction, dual (2 section) intake manifold is bolted to the inner edges of both cylinder heads, where it connects with all inlet ports. The end branches of each section run at 90 degrees to the connecting middle branch, thereby forming a T-junction at the dividing point which assures a uniform division and distribution of fuel to all cylinder inlets. Each manifold section feeds four cylinders-two in each bank. See figure 3-5. The Series 40 2-barrel carburetor feeds one barrel into each section of its 2-port manifold. 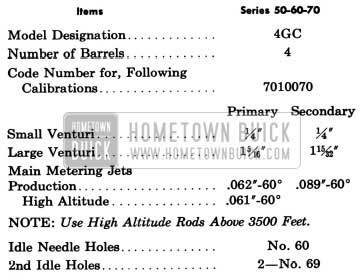 The Series 50-60-70 4-barrel carburetor feeds one primary and one secondary barrel into each section of its 4-port manifold. 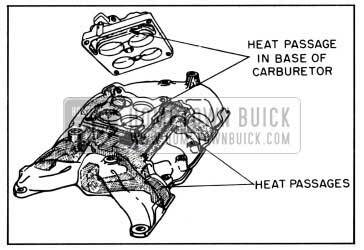 The 1957 Buick intake manifold is heated and hot spots are provided at the T-junction dividing points by crossover chambers cast along the outer walls of each end branch. These chambers connect to the two middle exhaust passages in each cylinder head. See figure 3-6. Hot spots located at the dividing junctions aid in vaporizing the heavier particles of fuel which are swept against the outer walls due to their greater momentum. The heated intake manifold also aids in obtaining a uniform fuel distribution. The 1957 Buick intake manifold is heated by exhaust gas cross-over passages cast under the center section of the manifold. These passages connect to the two middle exhaust passages in each cylinder head. See figure 3-6. Exhaust heat is supplied directly to the carburetor mounting surface by two holes drilled from the mounting surface into the cross-over passages. The carburetors are designed to conduct this heat around the throttle valve area to reduce engine stalling due to carburetor icing. A heat control valve with a bi-metal thermostat is locate in the right exhaust manifold. See figure 3-7. When the engine is cold and the thermostat closes the valve, the resulting back pressure in the manifold forces exhaust gas through the crossover passages in the intake manifold to the left exhaust manifold. As the engine warms up and the thermostat releases the valve, the flow of hot gas through the crossover chamber is reduced. Restricted openings in the metal intake manifold gaskets further reduce the flow of gases through the manifold when the engine is warm and the heat valve is open. Each cylinder exhausts through an individual port into a separate branch of the exhaust manifold. This manifold, referred to as the double “Y” type, is designed to provide a separation of 270 degrees crankshaft rotation between any two exhaust impulses in one branch of the manifold. This elimination of overlap within any given branch of the manifold permits valve timing that improves engine efficiency, minimizes exhaust valve burning, and effects more complete scavanging of exhaust gas from the cylinder. 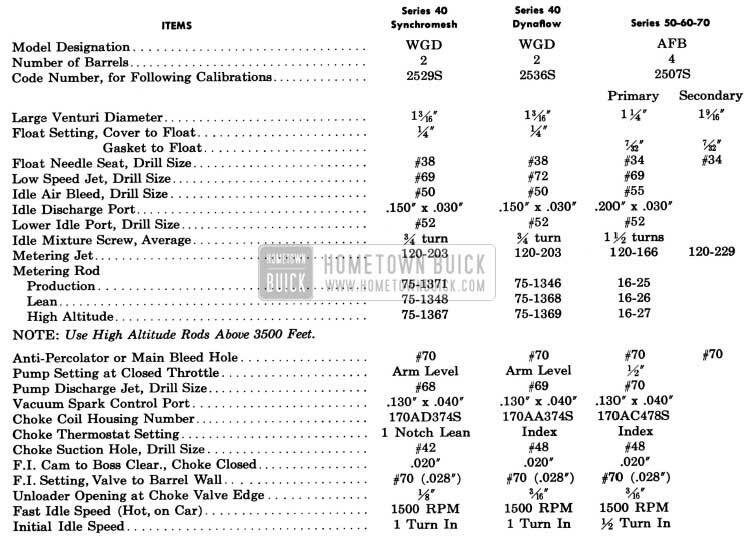 A dual exhaust system is standard equipment on 1957 Buick Series 70 cars and is optional on all Series 40-50-60 cars. See figure 3-8. The right exhaust manifold is the same on either single or dual exhaust cars. The left exhaust manifold, the exhaust pipes, the mufflers, and the tail pipes are not interchangeable between single and dual exhaust cars. The right manifold contains the valve which controls the supply of exhaust heat to the intake manifold, as described above (subpar. a). It also contains the carburetor choke heat stove which consists of an alloy steel heating tube mounted in a drilled hole in the manifold and a heating chamber located on the outside of the manifold. Heated air is drawn from the heat stove through an insulated pipe into the automatic choke housing. All joints between exhaust manifolds, exhaust pipes, two-section mufflers, and tail pipes are of the ball joint connector type. These joints make for easy connection, disconnection, and alignment of exhaust system parts. No gaskets are used in the entire exhaust system. 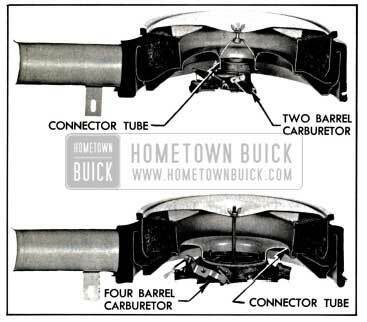 The 1957 Buick muffler is an oval-shaped, dynamic flow type having very low back pressure. It is double wrapped of heavy gauge sheet steel with a layer of asbestos placed between wrappings to aid in reduction of noise transfer and prevents any “oil-canning” effect. The muffler and exhaust pipes are supported by free hanging, rubber-fabric mountings which permit free movement but eliminate transfer of noise and vibration into the passenger compartment. 1957 Buick dual exhaust systems have a resonator located under each rear fender. Resonator drain holes must always be down, or they will fill with water. On dual exhaust jobs only, the pitman arm will strike the left exhaust pipe if it is not properly positioned. Position exhaust pipe so that it clears the pitman arm approximately 1 inch when front wheels are turned full left.